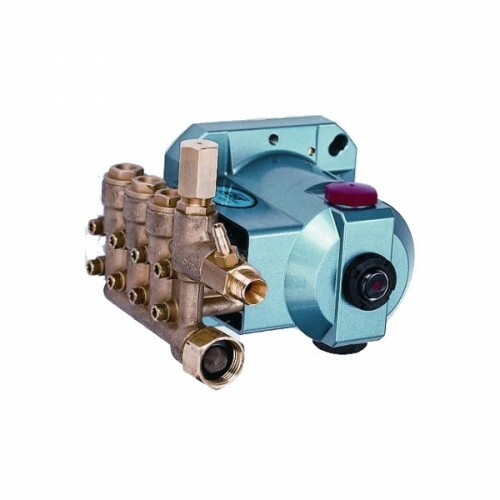 This compact, direct-drive [3450 RPM] triplex [three plunger rods] misting plunger pump includes a built-in integral pressure regulator for maintaining pressure with multiple-nozzles. When used with a 1725 RPM motor, it delivers half the flow. Pump construction consists of a brass manifold with 8 mounting screws for exceptional strength. Stainless steel valves, seats, and springs protect against corrosion and provide ultimate sealing and extended life of the pump. 100% wet seal design adds to service life by allowing pumped liquids to cool and lubricate on both sides. Specially formulated and unique design Hi-Pressure Seals offer unmatched performance and seal life. Special, concentric, high-density, polished, solid ceramic plungers provide a true wear surface and extended seal life. Strong chrome plated brass plunger rods with chrom-moly crosshead pin. Die cast flange-style aluminum crankcase means high-strength, lightweight, and excellent tolerance control. Heavy-duty crankshaft bearings provide extended drive-end life. Chrome-moly crankshaft provides unmatched strength and surface hardness for long-life. High strength connecting rods ensure durability and bearing quality. These pumps are flange-mount, hollow-shafted pumps designed to bolt directly to a C-Face electric motor, providing easy, compact installation in misting and humidification systems.